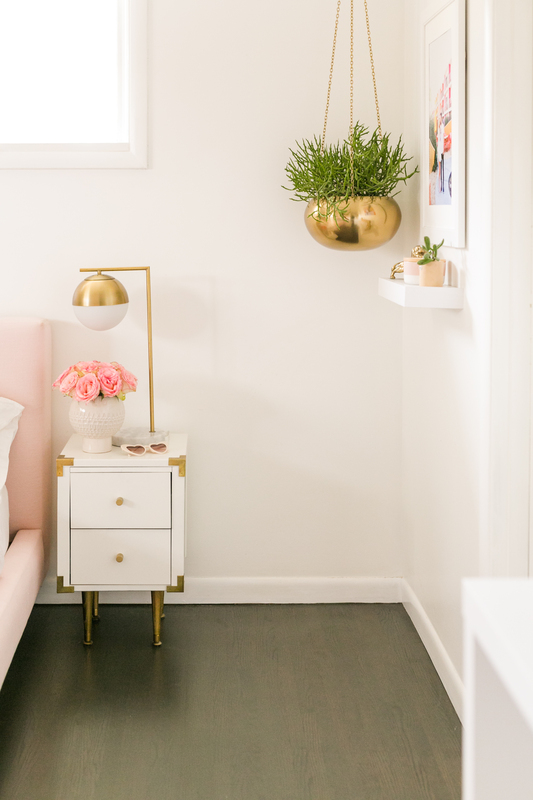 I love changing up my spaces from time to time to refresh the vibe of a room. 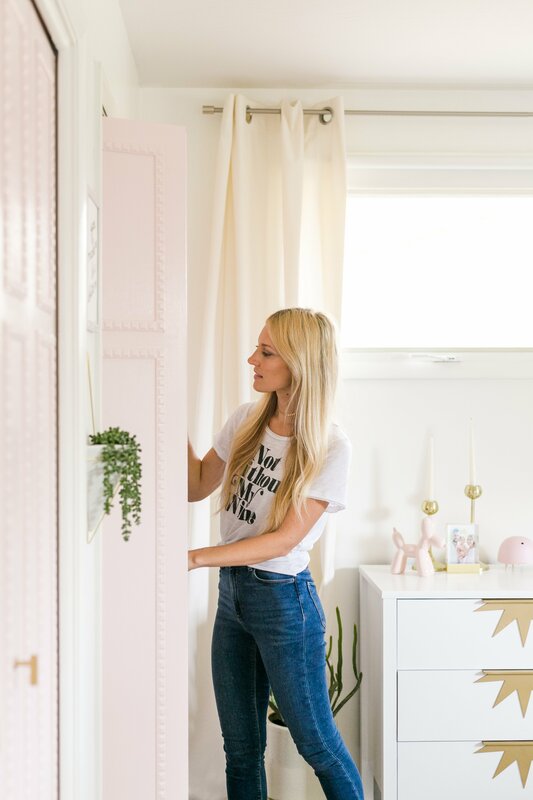 I’m pretty sure my husband, Todd, could live in the same house with the same things for his whole life and never notice, but I always feel like a room gets “stale” after looking exactly the same for a while. 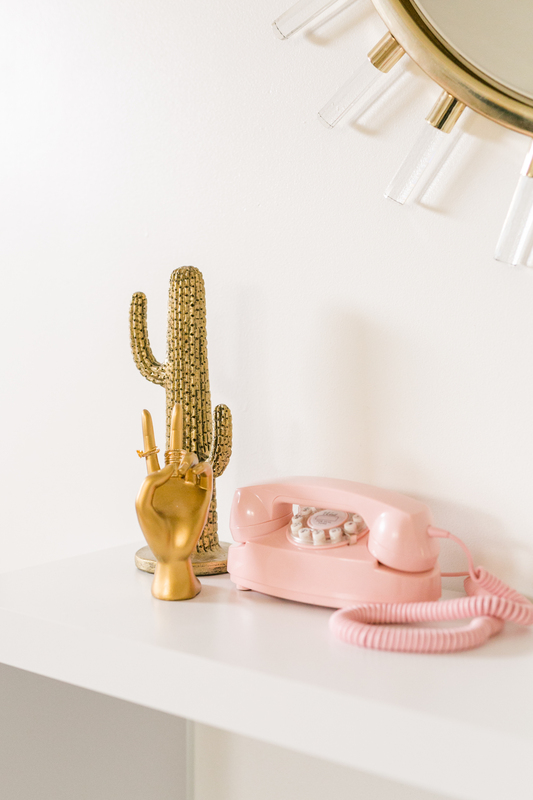 Now, refreshing a space doesn’t mean that you have to go out and buy all new items—heck no! 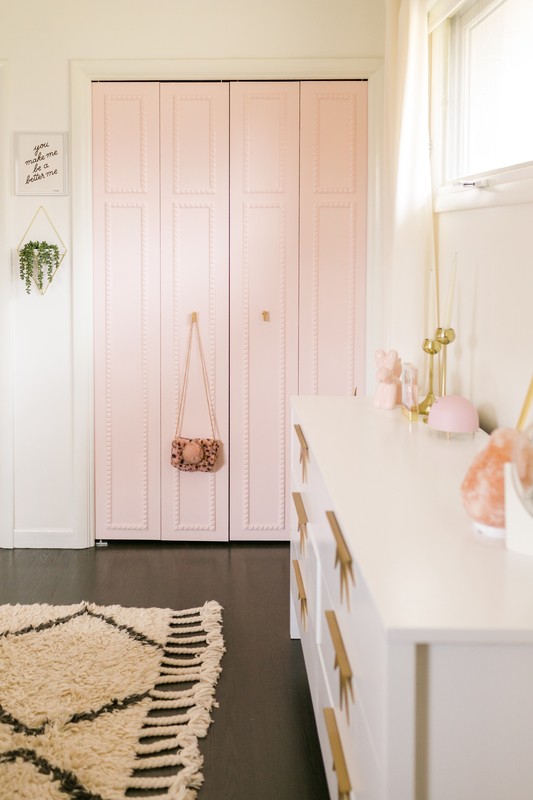 Usually, my room refreshes consist of a few new (or at least new-to-me items) mixed in with some original pieces, items from other places in the house, and some originals that have been transformed through some DIY magic. 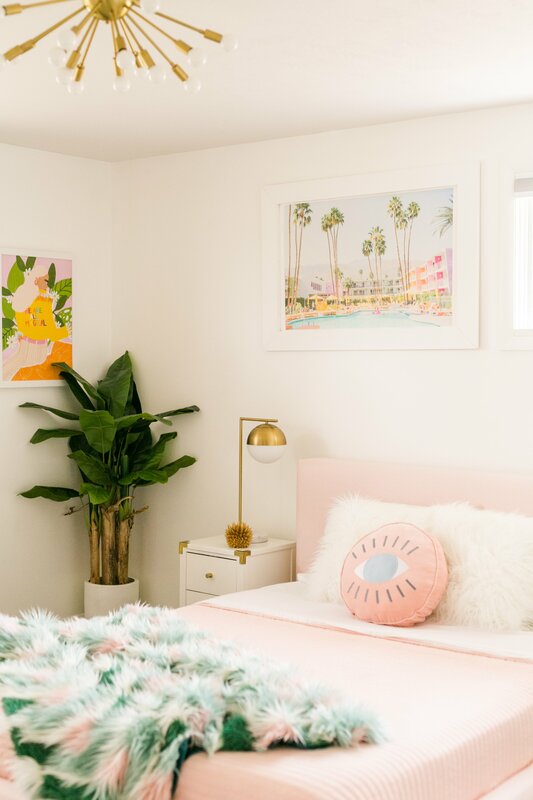 Our bedroom was one of the first rooms we worked on when we moved into our house 3.5 years ago (you can see what the first design looked like in this post), so I thought it could use a little makeover to feel even more bright and open. I think we bought our double dresser around the same time that we bought the bed (newlywed shopping!) and while I like the size and functionality of it, it’s also so dark and big that it just sucked up all the light on that side of the room. After a few (OK, a lot!) coats of white paint and a few added details, I love how unique it now looks and it makes a huge difference in the brightness of the room. This is the planter next to the dresser (I just painted the legs gold). I used to have a bookshelf in our room, but it just became a magnet for clutter with all the shelves. 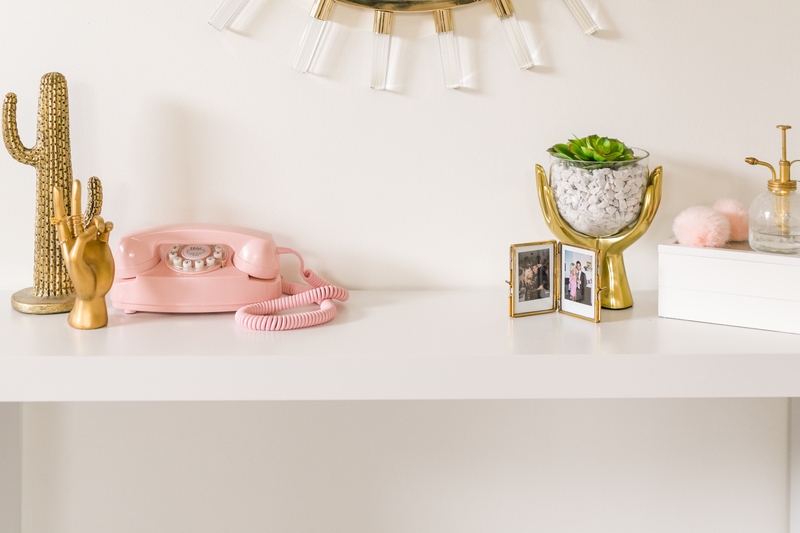 So I hunted down a skinny, simple console table (similar here) to hold a few simple fun things (like that super cute phone!) and that wall feels super clean and neat now. 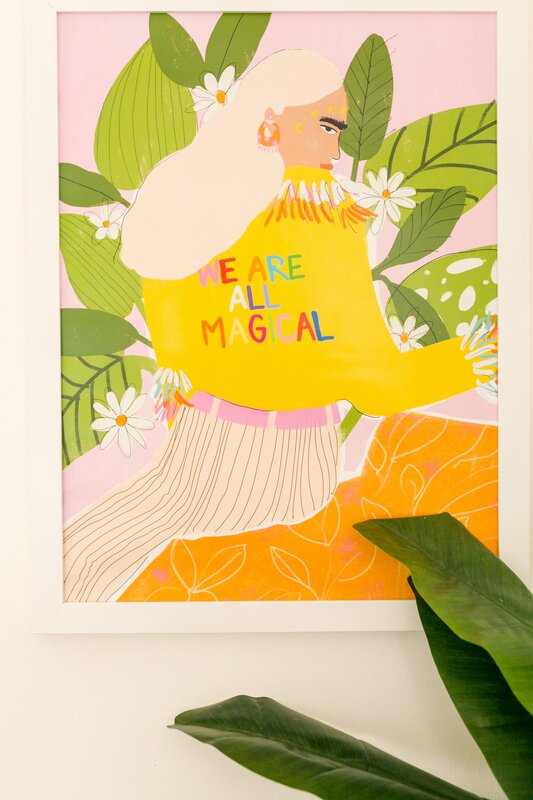 Also, that amazing mirror is sold out (sorry!) but I think this one is another really pretty take on a sunburst mirror. 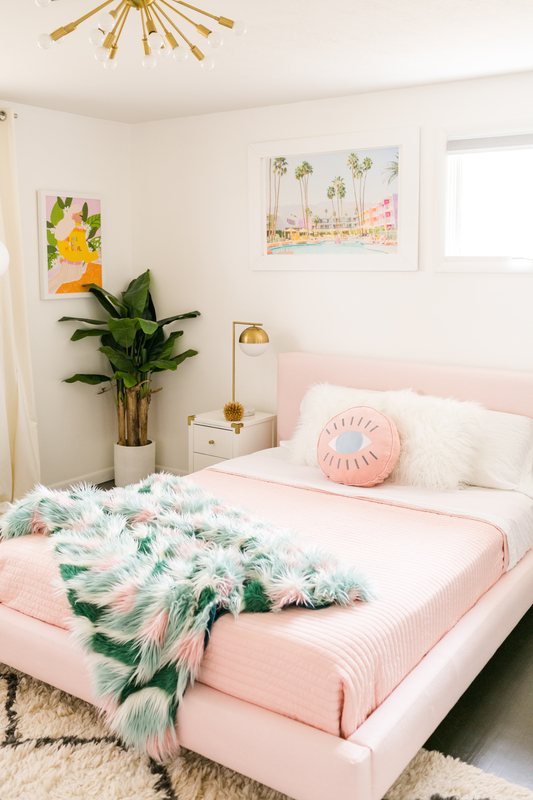 We’ve had this platform bed for coming up on nine years now and while I still liked the shape of it, the dark color wasn’t helping our room feel bright, so I did a DIY reupholstery to change it to pink and cover up the tufted buttons for a more modern feel—no regrets there! I’m still using my nightstands that I made over a few years ago, so I just gave them a new bit of paint here and there to touch them up a bit. 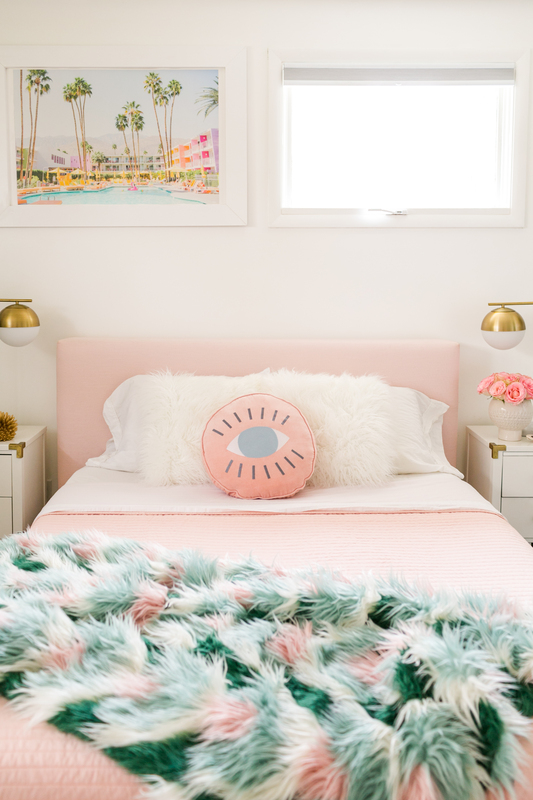 One of my favorite pieces in the room is actually that furry blanket—how fun is that?! 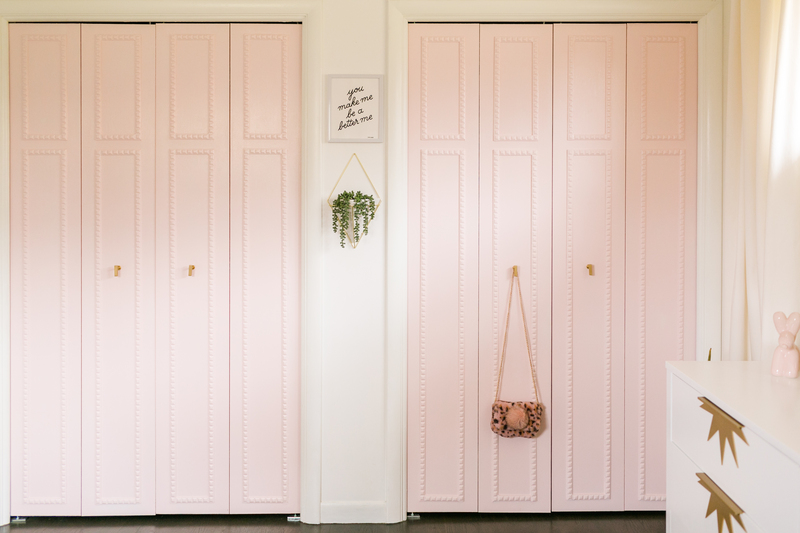 As much as l still love the trim on our DIY customized closet doors, I thought a new color would go a long way in making the room feel fresh, so I painted them a pale pink (Tartlet by Ecos) and I love how they turned out. 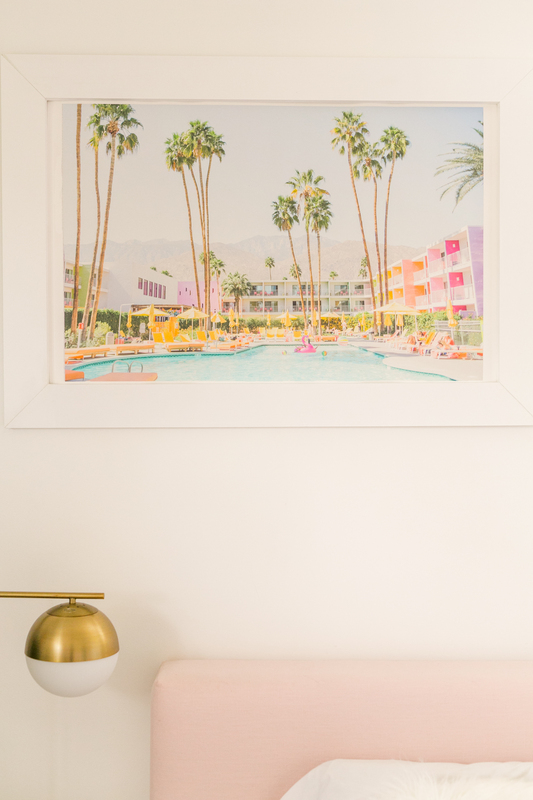 I wanted to add some colors that don’t usually appear in my house (usually I have a strict palette of select pastels I choose from) and this Palm Springs print was a perfect way to add color and a nod to the California/mid-century vibe we have going on in the house. 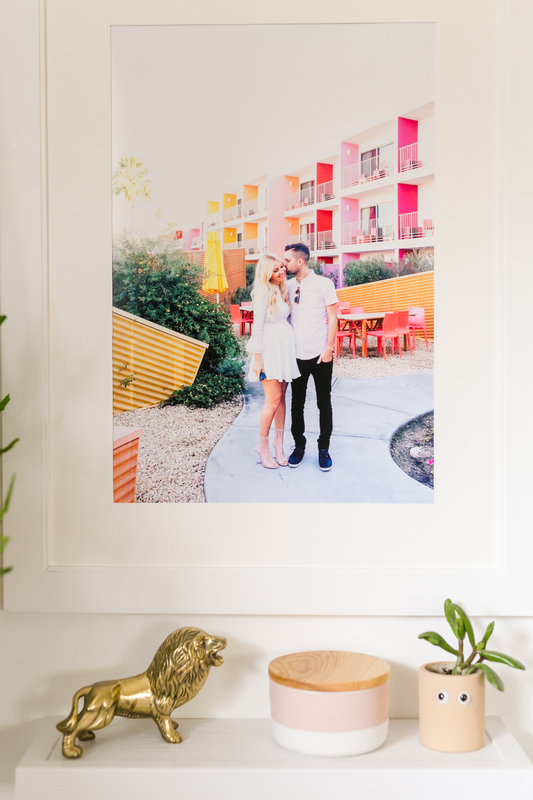 I also printed out a photo of Todd and I when we visited that Saguaro Hotel two years ago on our Babymoon vacation to hang on the wall next to the bed to add a personal touch to the space—take me baaaack!! 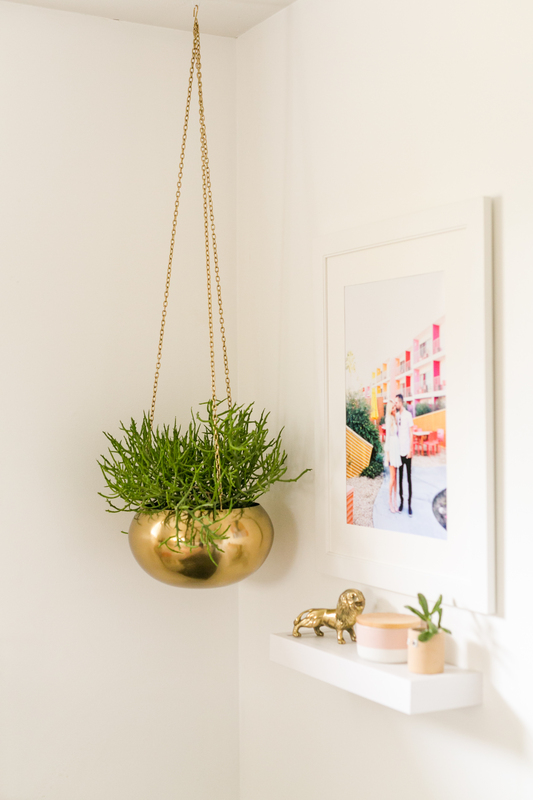 I have that gold hanging planter in a few rooms of the house (DIY version here) and I love how they lift a little greenery into the air. I love this room. 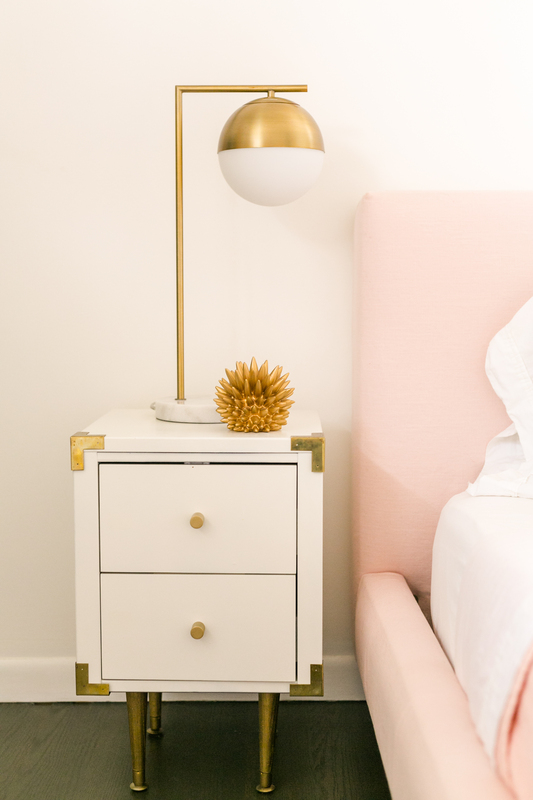 Where are the nightstands from? 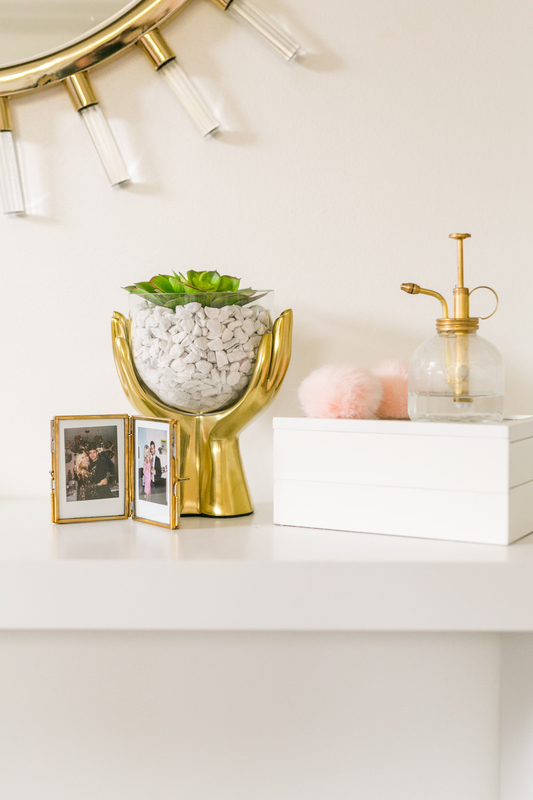 They were an old target nightstand makeover, they are linked in the post! Room is much warmer and cozy than its previous iteration! I know you used untinted white in the pros design but the walls seem warmer – what paint did you use for the walls? Beautiful ! You’ve given me many ideas for my bedroom. 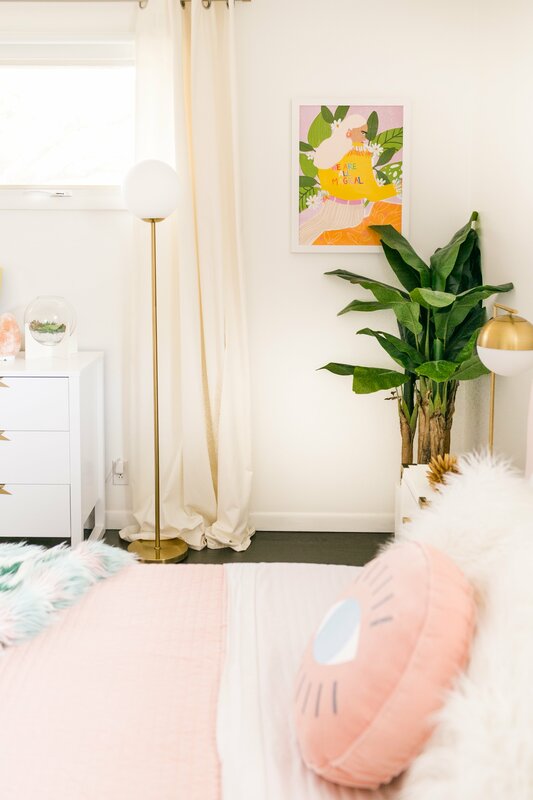 I can’t stop looking at this gorgeous room! It all works so well together & the attention to detail is exquisite! Where is that fun pink eye pillow and the pretty double hand planter from? 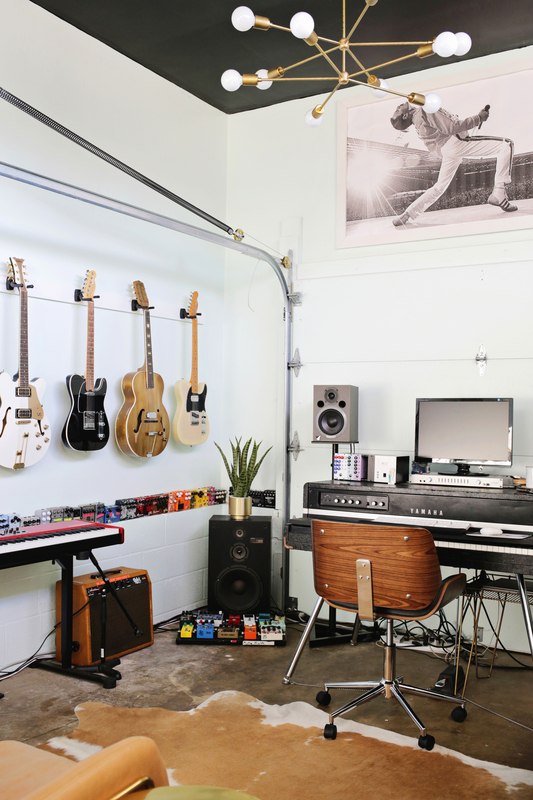 Serious room envy here! Great job! Great refresh! 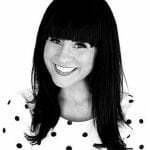 I’m the same way with needing to freshen up rooms every couple years to get a new energy flow from them. Got that from my mom who would rearrange our furniture all the time while I was growing up. This is unbelievably gorgeous! I’m using your house as the main inspiration for my fixer-upper. I’ve been looking everywhere for a quilt in that perfect shade of pink – where did you get yours? Thank you! 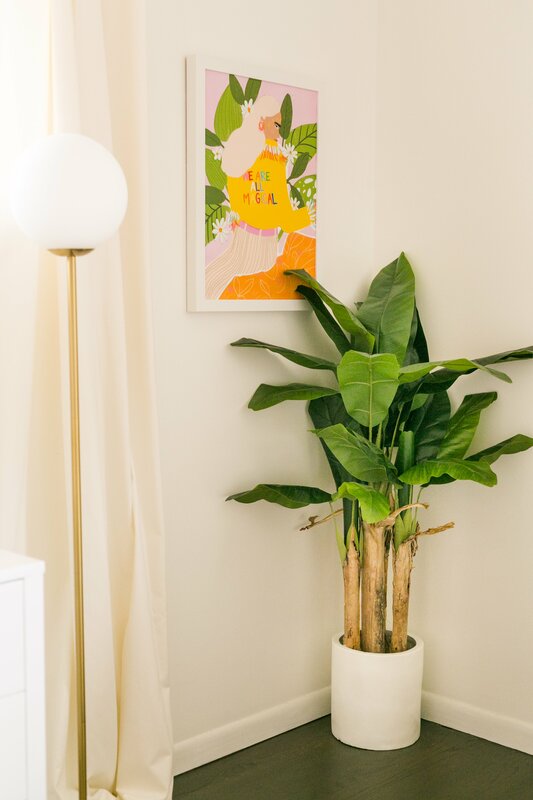 This is a really specific question, but I have that same diamond shaped wall planter and I need to fill it with greenery – is the plant you’re using real or fake and do you have a source for it? Thank you!! 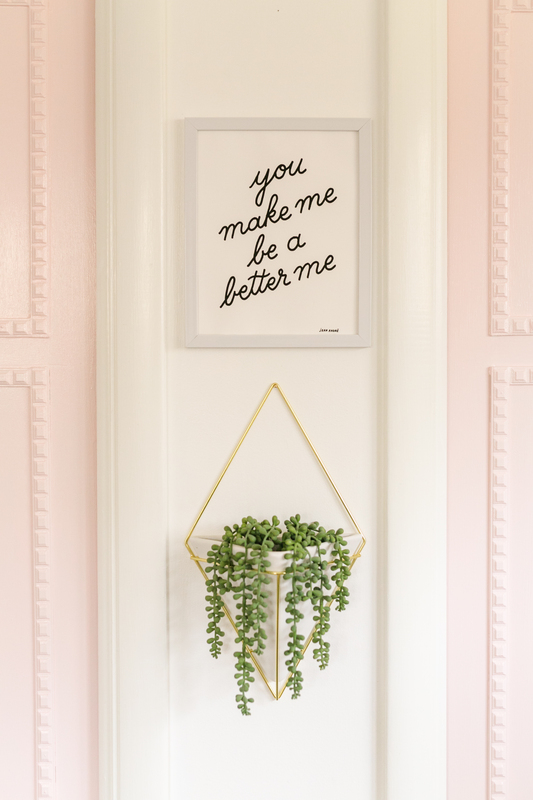 That one is fake-I like fake for planters on the wall so I don’t drip water down my walls when watering—try places like Joanns, Hobby Lobby, or Michaels and Target for faux plants! 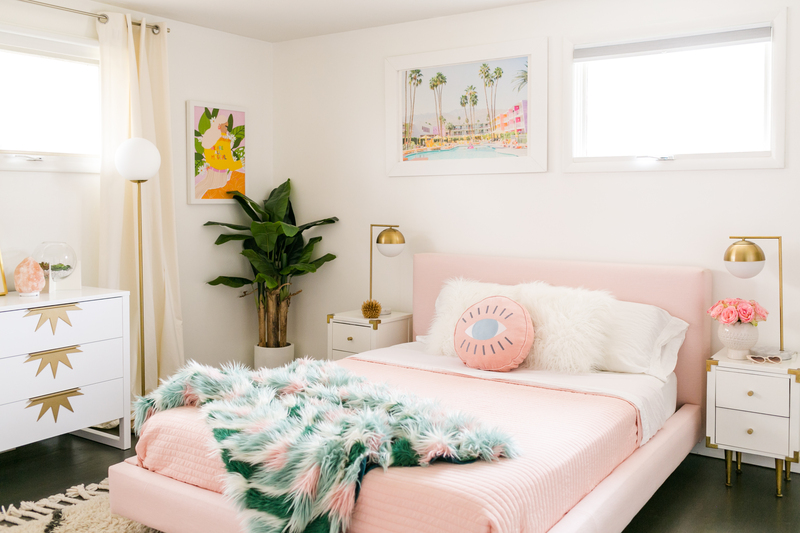 The space looks so refreshed and relaxing — perfect bedroom vibes for when you’re at the end of your day and you want to collapse in bed. Gorgeous! 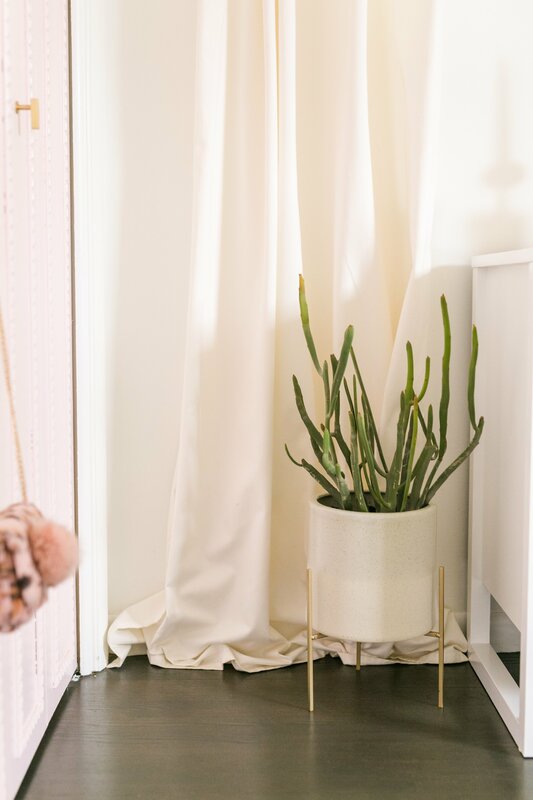 Would love to know what type of plant is in the small geometric hanging planter. : ) thanks! It’s so so so good Laura!!!! Oh no! That’s so awful, I’m sorry they stole it!! It’s a beautiful print! What type of plant do you have in the tall planter in the corner? Thanks!! SO bright and fun! That throw is… very very good. 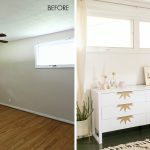 I loved your room before, but this refresh is amazing! 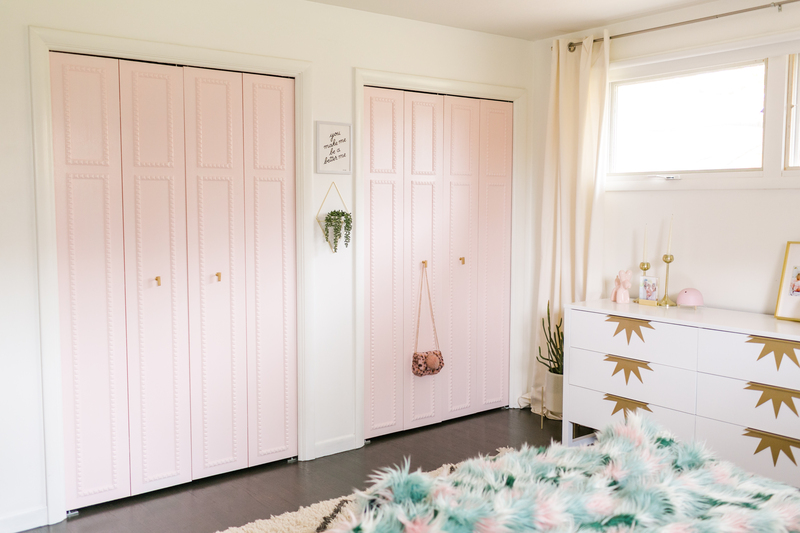 My favorite part is the pale pink closet doors. 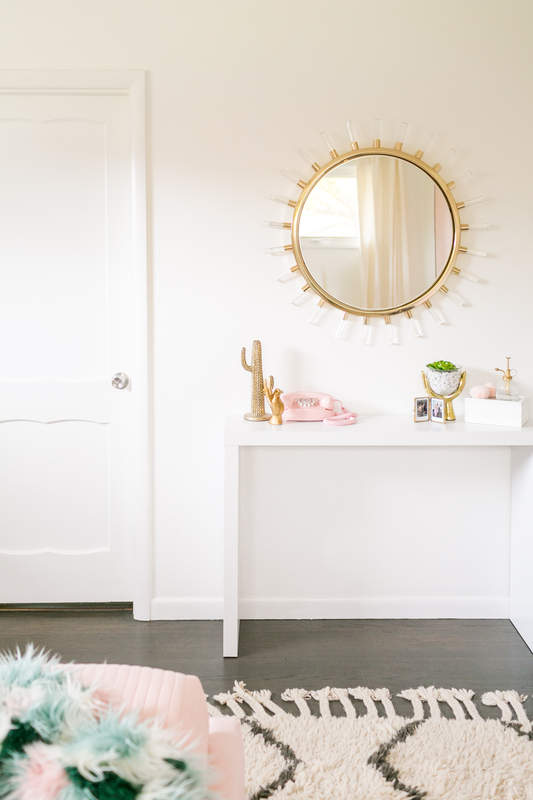 Also, I’m going to have to look into that simple console because I’ve been looking for something similar for my entryway. This is absolutely gorgeous! Way to go Laura!! 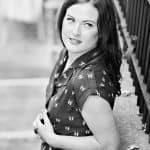 Would love to know what preset pack you used from A Color Story? I love how bright and clean the photos look! 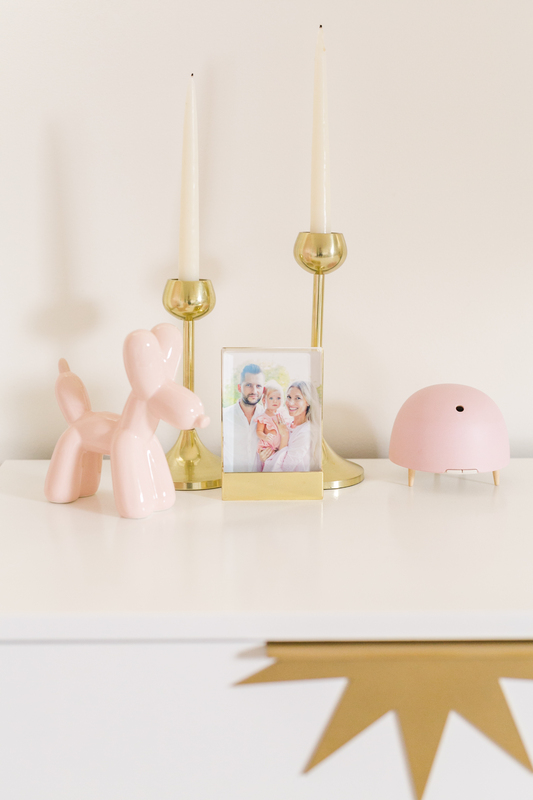 Where did you get the adorable pink balloon animal figurine? Where did you find the picture of the Saguaro hotel? I need tht in my life! Hello- I was wondering if you have a link to your curtains? 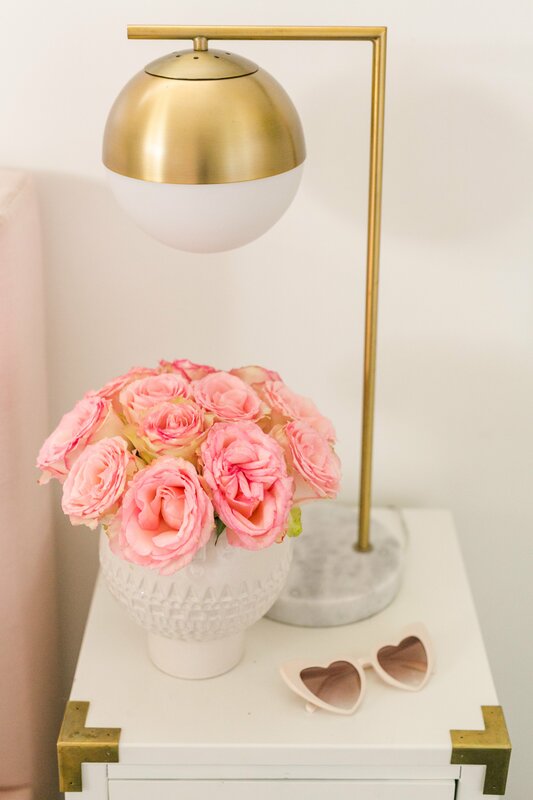 Need those for my daughters room, but hard to find the right cream color online. 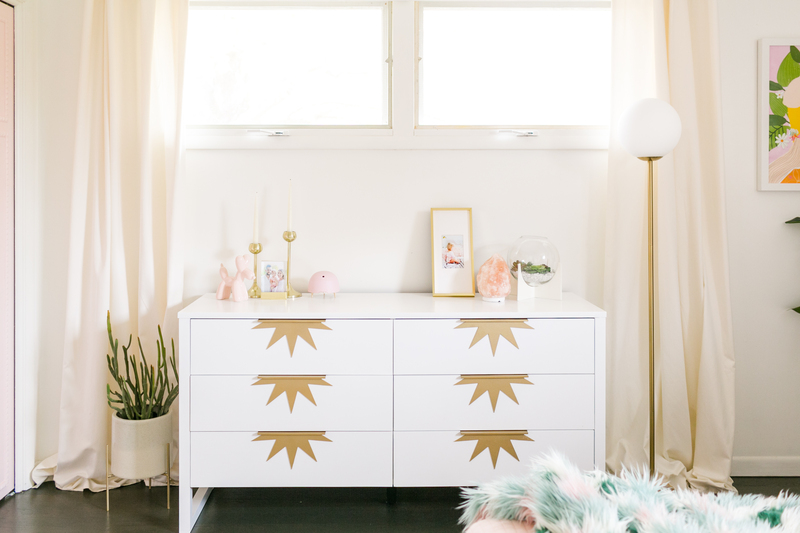 Where on earth is that amazing dresser from?!!! So in love! where is that tiny white floating shelf from under the picture of you?? I’m looking for something exactly like that that isn’t too far out from the wall. I’d appreciate it! 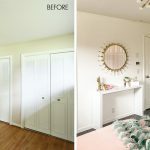 Using this as inspiration because this is such a good before and after and I’m about to re-do my bedroom because I’m moving and I’m a little nervous about it! 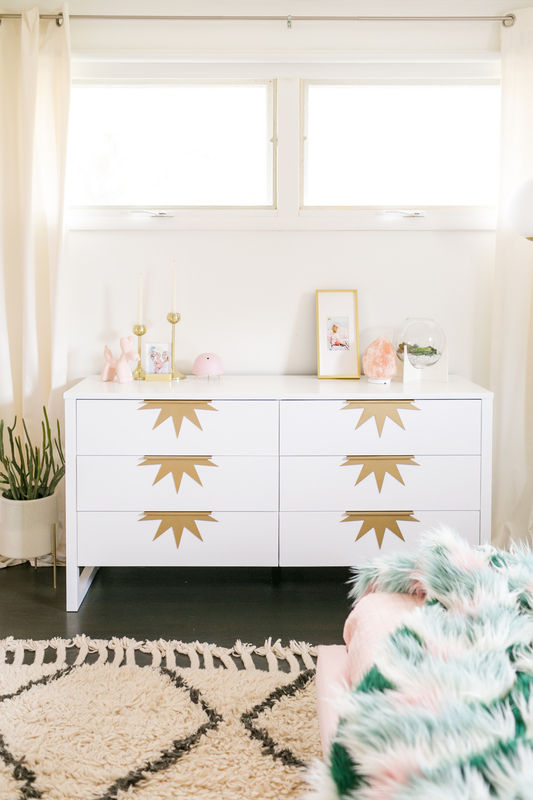 Love this whole redo! where is the pillow from?